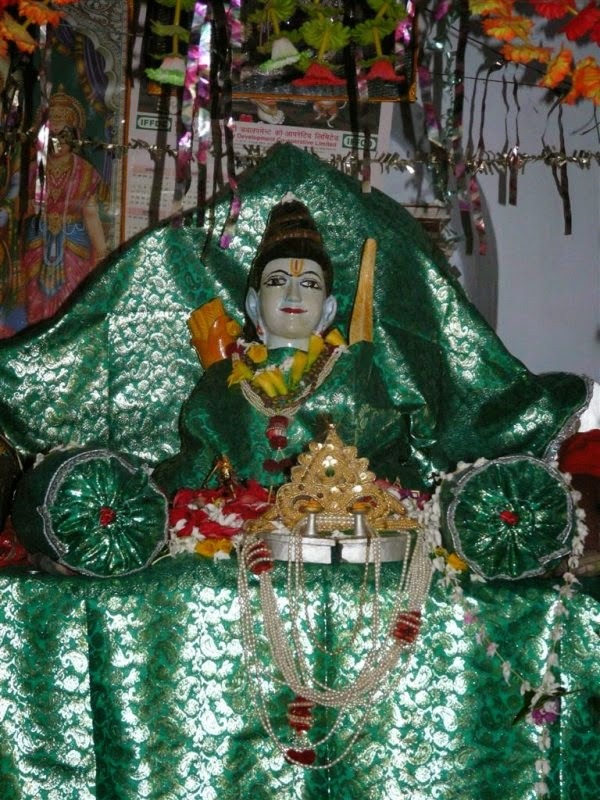 We have been visiting one by one various places connected with Sri Rama, in Ayodhya. Let us also cover Nandigram, the place located near Ayodhya now itself. Because we are not going to get back to Ayodhya once again to visit this place. 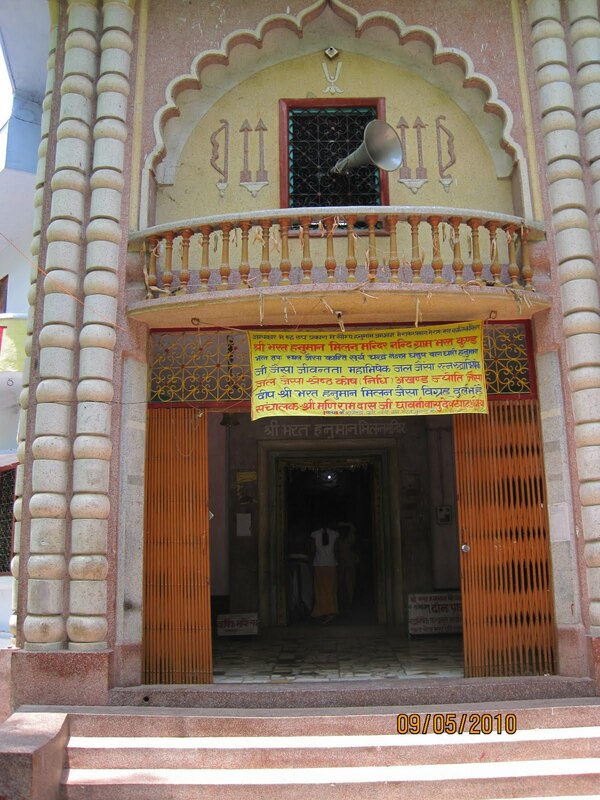 Nandigram is situated 20 kms south east of Ayodhya and 16 kms from Guptar Ghat. It was from here that Bharata ruled the kingdom for 14 years on behalf of Sri Rama. 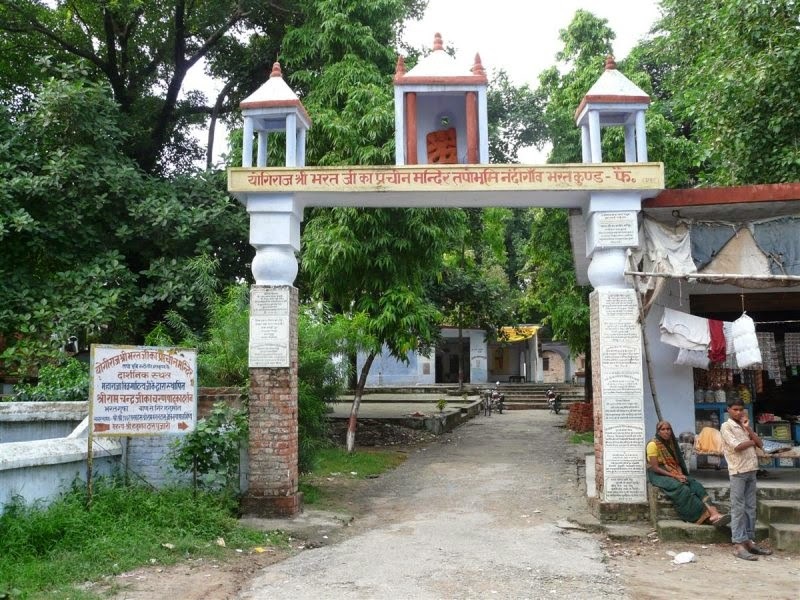 Important temples in Nandigram are Bharat Milap Mandir(old and new), Bharata-Rama Milap mandir, Bharata Gufa, Bharata Kund, 27 theerthas, Purva Chakiya near Nandigram. Bharata was an embodiment of virtue. Velukudi Swami explains Rama bhakti of all the 3 brothers in his discourse on Kamba Ramayana. 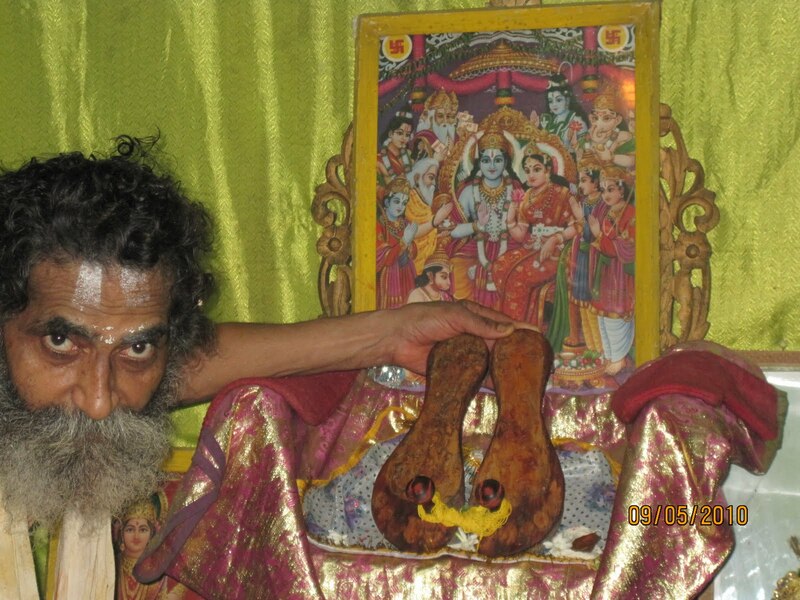 He says Lakshmana was an embodiment of “Dasa bhakti” as he was always serving Rama , Bharata did saranagathi demonstrating how a surrendered soul should behave with the Lord having utmost faith on the Lord, and Shatruguna demonstrated “Bhagavata bhakti” as he was constantly serving Bharata, the greatest Bhagavatha(devotee) of the Lord. Bharata was adept in Dharma like Sri Rama. He could have ruled the world if he wanted to but he preferred to be “Rama Daasa” - servant of Rama. The priest referred to Kaikeyi’s efforts in getting the kingdom for Bharata. He rejected the fortune bestowed on him of ruling the kingdom and preferred to be servant of Rama. Even when the ministers and elders including his preceptor, Sage Vasishta persuaded him, he didn't accept the throne and decided to bring Sri Rama back to Ayodhya. He convinced Kausalya that he was innocent and was not aware of his mother’s plans by pronouncing that he would suffer from various types of hellish punishments if he was part of Kaikeyi's plan. Because of Kaikeyi's character, Bharata was doubted by everyone including Guha and Bharadwaja Rishi. When he learnt from Guha that Sri Rama had tied jada mudi (like ascetics), he immediately tied the jada mudi and Shatruguna followed the suit. When Guha showed him the place where Sri Rama rested, he fell on the ground and cried inconsolably blaming himself for Sri Rama’s fate. He neither ate nor slept during Rama’s exile. He self-imposed punishment on him and during the 14 years, he didn't enter Ayodhya. Such was the bhakti of Bharata. He demonstrated how a saranagathan (one who has taken shelter at Lord’s feet) should behave. He did what was instructed by Sri Rama and never disobeyed or back-answered him. Aidyen is incompetent to describe Bharata’s qualities….. It is well known that Bharata approached Sri Rama at Chitrakoot accompanied by Rishis, priests, queens and citizens of Ayodhya and pleaded Sri Rama to accept the throne. As Sri Rama was very firm in fulfilling HIS father’s promise, HE refused to return to Ayodhya. Bharata decided to end his life by fasting unto death by lying on a kusa grass in front of Rama with a vow to fast unto death but was stopped by Sri Rama. Bharata did saranagathi to Sri Rama and prayed the Lord to give HIS padukas(sandals) to be kept on the throne and declared that he would act as Lord’s representative for 14 years. He also took a vow to end his life on the first day of the beginning of the 15th year in case Sri Rama failed to return. Such was his bhakti. Though the kingdom was given to him, he simply discarded it and preferred to be Lord’s servant. He ruled Ayodhya on behalf of Sri Rama from Nandigramam efficiently adding enough wealth to the Treasury. Therefore, those visiting Ayodhya, should make it a point to visit this place. A great old person is maintaining this for the past 70 years or so. He is so intimately connected with this, that Bharata and Hanuman converse with him! By seeing him, we can visually see what Tyagam is, and once we have understood it properly by visiting this place, there might not be any need for the Lord to take all efforts to explain! 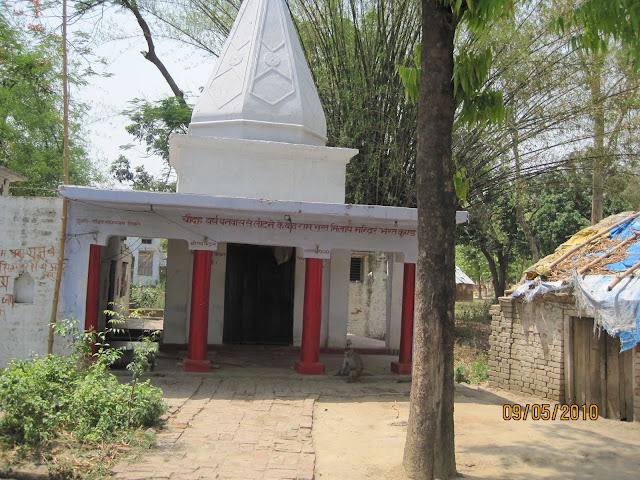 There are two temples for Bharata at Nandigram - old temple and new temple in different premises. 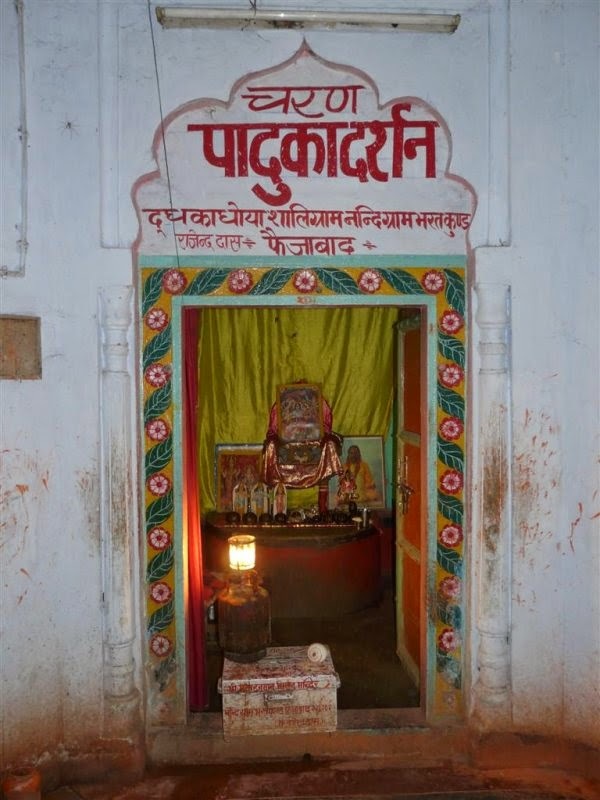 Both the temples have sannidhi for Bharata with Rama paduka, Bharat gufa(where he stayed), Hanuman sannidhis. The temple complex of Old Bharat Milap Mandir houses Bharat Gufa on the left, Hanuman sannidhi on the right and in the main shrine, a small vigraham of Bharata in meditative posture is seen. In front of this idol is the Rama Paaduka. Here Ram charitra Manas is chanted throughout the day. There is a photograph of Bharat and Hanuman hugging each other. 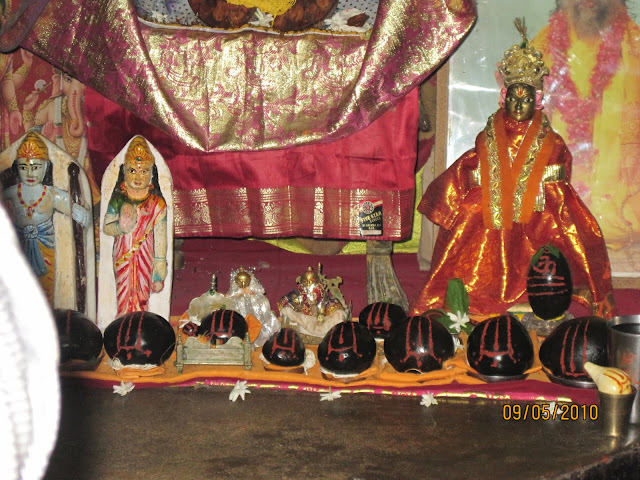 Rama are placed along with few saalagramams with a photo of Sri Rama pattabhishekam. These salagramam murthis are of very rare kind and can be found in only 4 places, one among them is Tirumala. 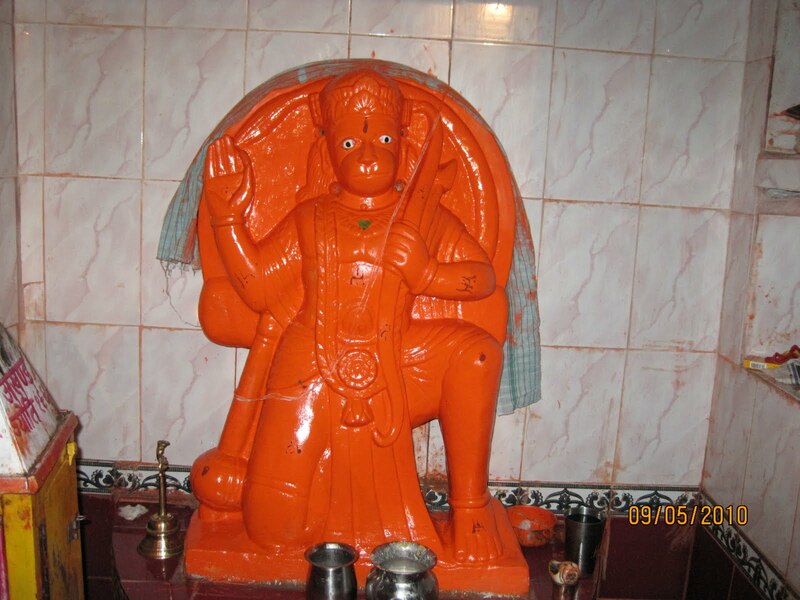 On the left side is "Lagey Hanuman" sannidhi. "Lagey" means hurt. As Hanuman was hurt by an arrow shot by Bharata while he was carrying Sanjeevini mountain to Srilanka to rescue Lakshmana, he is known thus. Bharata mistook his huge figure to be some rakshasa and shot an arrow. 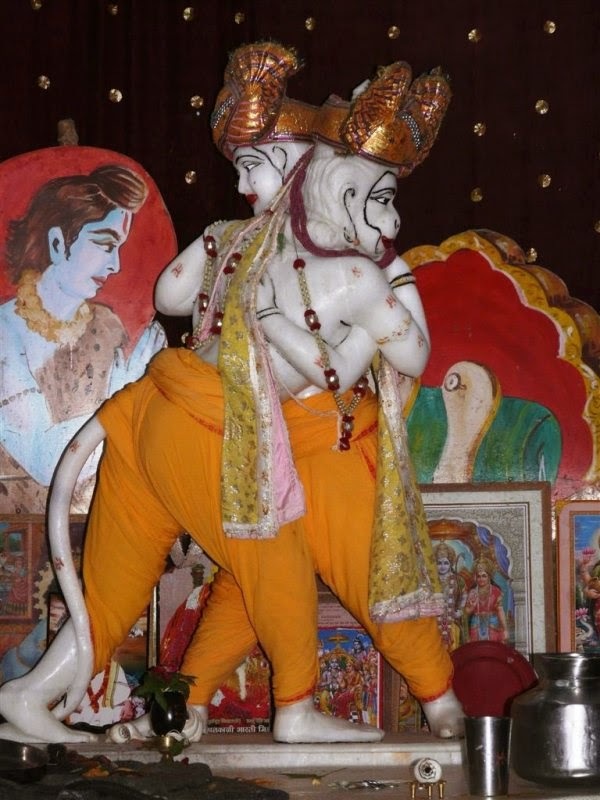 Hanuman was hurt in his left knee as a result of which his speed reduced and was falling down uttering "JAI SITA RAM". Hearing this, Bharata reiterated, the rishis intervened and saw that there was no fight between two Rama bhaktas. They blessed Hanuman to continue with his flight. This incident is mentioned in Ram Charita Manas and also in Valmiki Ramayana. Another interesting feature is when lights are on, Hanuman is in calm mood and when lights are put off, he looks ferocious in dark. The idol of Bharata and Hanuman, the two great devotees of Rama, hugging each other looks full of life. After defeating Ravana and rescuing Sita Devi, SriRama along with Vibhishana, Sugreeva and other vanaras started HIS journey on Pushpaka Vimanam to Ayodhya. The Lord stopped at Bharadwaja ashram to pay respects to the muni. The rishi requested Sri Rama to stay there for a night and proceed in the morning and Sri Rama was compelled to stay back but was worried about Bharata. Bharata had earlier vowed that in case he doesn’t have Sri Rama’s darshan on the 1st day of the beginning of 15th year, he would end his life. The Lord summoned Hanuman, who is “Prana dhaata” to go to Nandigram and convey the message of HIS arrival to Bharata who would be eagerly awaiting to receive HIM. As predicted, Bharata had lit the pyre and was circumbulating it before jumping into it. Hanuman who saw this from sky started glorifying Sri Rama and thus stopped Bharata from the dreadful act. He alighted on the ground, introduced himself to Bharata and both of them hugged each other. This incident is beautifully depicted in this temple. Purva Chakiya is the place where Sri Rama, Sita and Lakshmana along with Sumantara spent their first night of exile on the banks of River Tamasa. They were followed by the citizens of Ayodhya. The citizens of ayodhya were persuading Sri Rama to return to Ayodhya but Sri Rama was keen in fulfilling HIS father’s promise. While the citizens were asleep, Sri Rama instructed Sumantara to leave the chariot imprints towards Ayodhya so that the people would believe that Sri Rama had gone back. After fulfilling Sri Rama’s commands, Sumantara drove Sri Rama towards south. The citizens saw the chariot marks and thought that Sri Rama might have returned to Ayodhya and returned back. This is approximately 3 kms from Bharat Mandir in a very narrow lane in a field. One has to walk across the fields over a single foot narrow path for about 10 minutes and reach the spot. 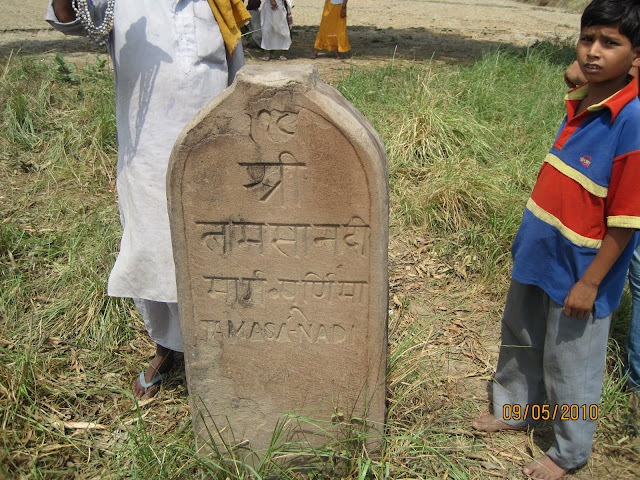 A stone is laid as a mark of River Tamasa where Sita Rama rested. Tamasa river flows nearby but the water has almost dried up. Earlier that place used to be full of water but in course of time, the river has almost completely dried up. There is no temple. Buses cannot go there. One has to go by foot to find the stone marked about Sri Rama’s stay. Bharatha Kund is about half a kilometre from Bharata Mandir. 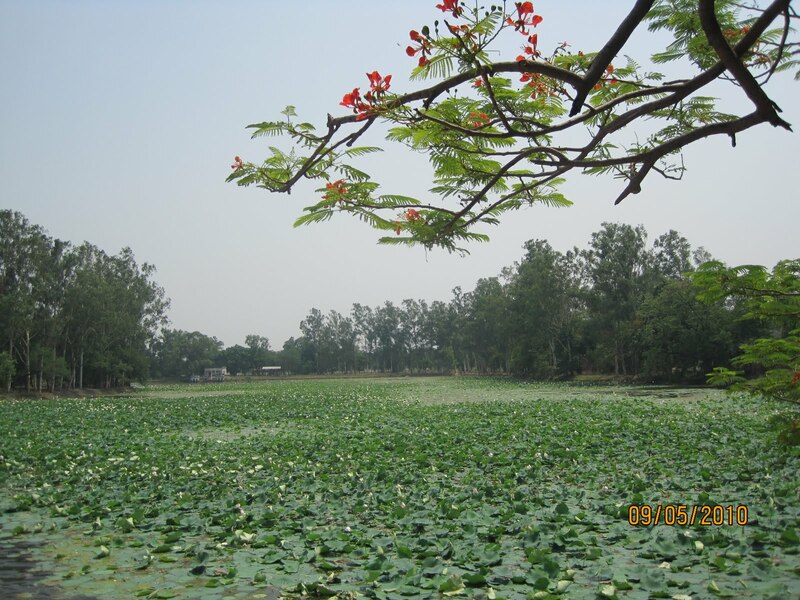 This kund is full of lotus flowers. 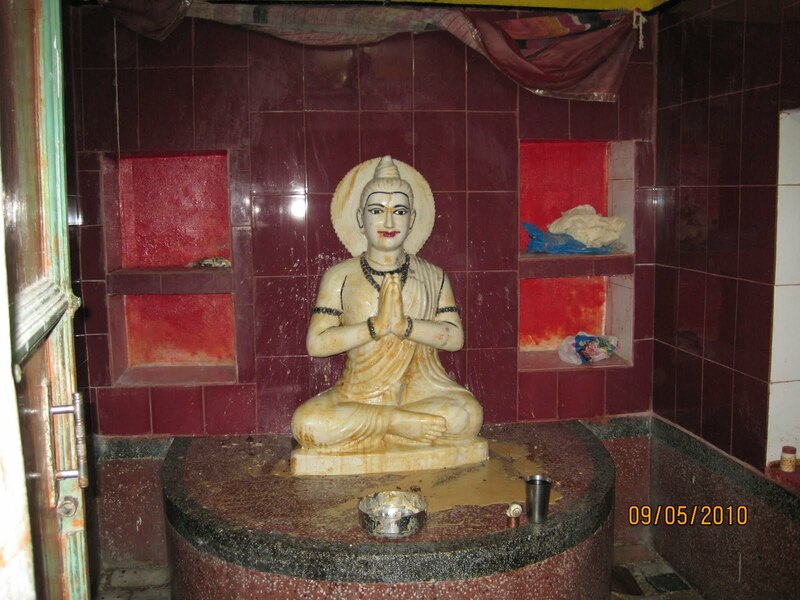 During his stay at Nandigram, Bharata used to have bath in River Saruyu at this place before sunrise. Sri Rama-Bharata Milap Mandir is near Bharata Kund. As the name suggests, Sri Rama met Bharata at this place. It was here that Sri Rama and his brothers shaved off their jadaimudis. 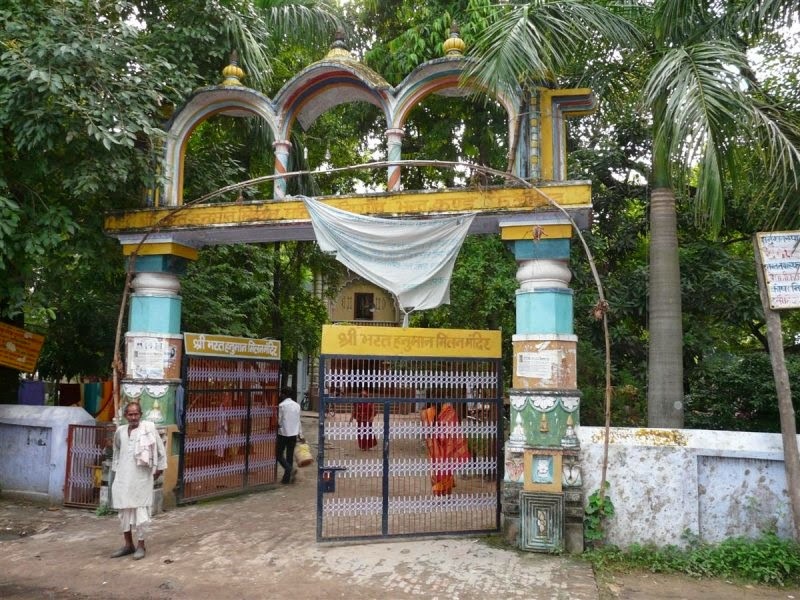 It is mentioned in the Pattabhishekam sargam in Yuddha kaandam, that Shatruguna summoned efficient barbers to shave off the jadamudis of all the 4 brothers, had mangala snaanam and were decorated with royal costumes at this place. Kausalya decorated Sita devi with the best of ornaments and clothes and all of them proceeded to Ayodhya from this place. Sri Rama and Sita were seated in the chariot, Bharata seated beside Sumantara was holding the reins of the chariot, Lakshmana and Vibishana were fanning the Lord while Shatruguna was holding the royal white umbrella and the vaanaras were following them. Brahmins reciting Swasthi vachanams were going in the front, mangala vaadiyam accompanied by songs and dance were displayed, the streets and houses all through the way were decorated with flowers and lamp welcoming Sri Rama. Near Bharat mandir, there is another place where Bharata used to meditate sitting under a banyan tree. The speciality of this tree is that the roots do not touch the ground, they get absorbed into the tree. There is a small well near the tree which contains 27 punya theerthas. Paduka literally means footwear. You might be familiar with the term Paduka Pattabishekham in Ramayanam. When Bhagawan Sriramachandra left for forest at the behest of his step mother Kaikeyi, his younger brother Bharatha (who was to be crowned as emperor and who spurned the throne) came in search of his elder brother with a view to persuade him to come back to Ayodhya and accept the throne. But when Sriramachandra regretted his inability to disobey his father`s orders on grounds of observing Dharma of a son, Bharata requested Sriramachandra to be gracious enough to spare the latter`s footwear so that the Paduka could be installed as the ruler of Ayodhya in the abscence of Sriramachandra. Bharatha carried the Paduka of Sriramachandra on his head with all devotion and got it installed with due religious fervour. For the next 14 years until Sriramachandra returned to Ayodhya, Bharatha regarded the Paduka as emperor and worshipped it. In our tradition, we bend and prostrate before holy and realized persons. Some people touch the feet of others as a mark of respect and prostration. Touching the Paduka of holy/revered people is as good as touching their feet. It is a sign of subliming our ego. Worshipping the Paduka is as good as worshipping the Lord or the Holy person. In this regard the following thoughts come to my mind. Incidentally, there is a devotional composition called PADUKASAHASRAM which the Srivaishnavites regard as a sacred text and chant frequently. 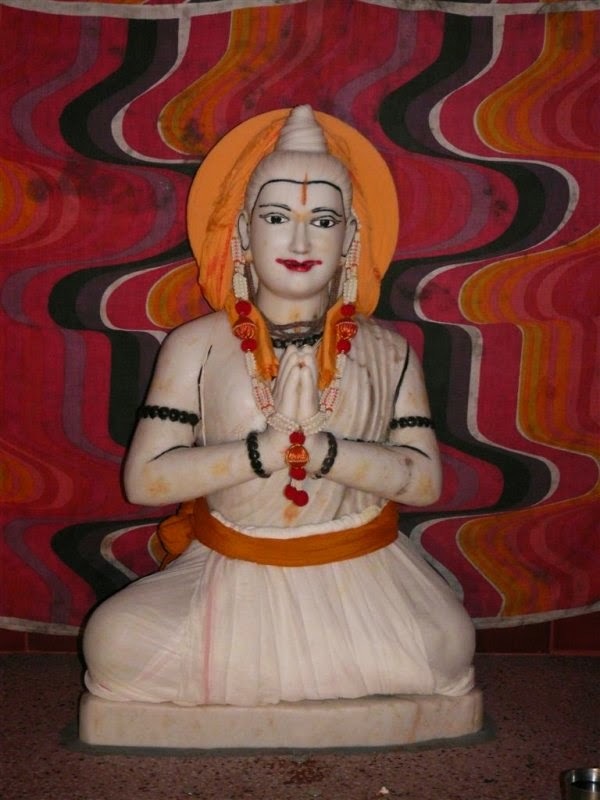 Vedanta Desika (Swami Desikan, Swami Vedanta Desikan, Thoopul Nigamaantha Desikan) (1269–1370) was a Sri Vaishnava Guru. He was a poet, devotee, philosopher and master-teacher. He was the disciple of Swamy Sri Kidambi Appullar alias Sri Aathreya Ramanujachariar who comes in the lineage starting from Sri Ramanuja with Sri Thirukurugai Piran Pillan alias Sri Kurugesar,Sri Kidambi Aachan, Sri Aathreya Ramanujar, Sri Aathreya Rangarajachariar and many in the order. He is considered as an Avatar (incarnation) of the divine bell of Lord Venkateswara of Tirumalai by Sri Vaishavites. The birth of Vedanta Desika was in the Kali yuga year 4370, which corresponds to 1268 AD in the Tamil Year Vibhava, month Purattaasi, on the Dasami day of Sukla Paksha, a Wednesday, in the constellation of Sravanam (the same as that of Lord of Tirumalai).He was born in Thooppul, near Tiruttangaa (Himavanam) adjacent to the temple of Deepa Prakaasar in Kanchipuram, the birthplace of Poigai Alwar. Meaning: Swami Desika's son Varadacharya implores "the great lion of poetics and dialectics and the great preceptor of Vedanta (that Swami Venkatanatha was) should reside in his heart always." Paaduka Sahasram or "1008 Verses on the Sandals of the Lord" is considered to be Desikan's Magnum Opus. The whole work is a monument for supreme devotion and superb poetry, all in one night’s intuition, - an overnight miracle of one thousand verses! It was done by him just as a fulfilment of a competition committed to as a challenge by his disciples. All this was composed by Desika (as he puts it, by the Grace of the Paduka of the Divine) in just one quarter of the night, actually the third quarter. The earlier two quarters were devoted by him, as soon as he accepted the commitment, to yoga and yoga-nidra (sleep induced by yoga and resulting in intuition). Paduka Sahasram has 32 "Padhadhi"s. Reading each padhadhi everyday, thereby completing in 32 days. Many believed to have achieved their wishes by completing this exercise. Doing parayana of paduka sahasram helps to attain moksha. Wonderful language, chitra-padams were used in these slokas. Mainly sung on the padukas of Lord Rama, Lord Renganatha and Lord Krishna, praying for attaining Moksha. Paduka Sahara Parayanam yields miraculous benefits and self-realization.